Your body was built for a lot of activity and gets stronger the more you work out, but some parts are naturally weaker than others. You may work hard to increase your stability, strength, and stamina but the ankle, which is a complex joint at a key position in your maneuvering structure, is still the weakest part of your leg. A simple matter of uneven ground or landing slightly wrong can throw your whole ankle out of position and potentially cause an injury ranging from very mild to significant damage. In fact, you don't have to be an athlete to put your ankles at risk. Normal people turn, sprain, and even fracture their ankles all the time doing everyday activities like walking the dog or shopping for groceries. An injured ankle is nothing to be embarrassed or upset about, but you should take your treatment steps very seriously because it's difficult to judge the severity of an ankle injury until a doctor has thoroughly examined it. Ankle injuries happen in a variety of ways ranging from taking a single step incorrectly to sudden violent impact. Whether your ankle turned as you stepped off a curb or twisted badly during a training session, the actual damage done will determine how extensive your treatment methods will need to be. Your ankle is made up of ligaments which are like very strong elastic bands that hold the bones of your legs and feet together while giving you the flexibility to move and maneuver. Tendons, on the other hand, connect the muscles that do the work that allows your ankle and foot to move and stabilize when you walk. If one of the bones around or in your ankle breaks, you have a long healing process ahead of you while the bone mends. This most often occurs as the result of a sharp impact or possibly crushing damage, both of which can occur in active sports or as the result of an unfortunate car or falling accident. Sprains are the most common form of ankle injury and are the result of damage to your tendons, usually caused by stretching them beyond their capacity either once badly or a little bit over an extended period of time. A single painful sprain is usually an instance of the former, often from landing or pushing off in a way that forces the ankle to flex further than the tendons can stretch. This causes tears in the tendons, big or small, which must be allowed to heal before you resume stressful movement tasks. Short term sprains tend to come from little tears while severe ones with long recovery times are usually the result of one big tear. Strains are a lot like sprains, but they also involve the muscle. When you stretch your ankle too far, if the muscle is tight and not ready to stretch, both the tendon and muscle can take damage. This will require additional healing and stretching for full recovery. Tendinitis is the term for an inflamed or swollen tendon. Tendinosis, on the other hand, is the result of dozens of micro-tears in your tendon and can happen to athletes after repeated over-stretching without proper healing in between intense training sessions. Both are like sprains but can happen slowly over time. When an ankle injury occurs, you have very little way to know exactly how serious it is right off the bat. Intensity of pain and ability to support weight are good indications, but only a doctor or experienced medic can examine the damage and let you know exactly what will be required for healing. That said, there are a few treatment methods you or a friend can do in the moments immediately after the injury that will help in almost any circumstance. These conform to the basic principles of RICE, a combination of methods often used to treat sports injuries involving sprains, strains, and minor fractures. Your first action should be to perform a minor inspection yourself or with the help of a medically knowledgeable friend. Carefully remove the shoe and sock, doing your best to avoid tugging on the ankle. Sitting down, assess how much control you have over the ankle without putting weight on it. Check how much and where it hurts if you move the ankle while holding your foot above the ground. You should be able to see if the ankle has begun to swell and examine with gentle probing if anything feels out of place, is sharply painful, or just sore. Sharp pains from probing could be an indication of a fracture. Bracing yourself on something sturdy, test to see if your ankle can hold weight. If not and you are alone, it's time to call a friend to help you get home. Before you see the doctor, the best thing you can do for an ankle injury is to stay off it, wrap it tightly, and ice it to reduce swelling. Any basic first aid kit should at the very least include an elastic bandage which should be wrapped firmly around the ankle and base of the foot to immobilize and compress the injured area. Make sure not to wrap so tightly that circulation is cut off. From here, wrap a bag of ice in a towel and keep the area cold so that swelling can't cause further pain and damage. Keeping the ankle comfortably elevated will also prevent blood pooling and help to reduce swelling. Now that the ankle is secured, it's time to see a doctor. They will want to unwrap the ankle, then manipulate it to examine the full extent of the damage. While it may hurt, this will generally involve holding the foot and carefully rotating and twisting, assessing where it hurts and how much along with the extent of swelling and signs of a fracture. You will probably need some kind of ankle support or brace during recovery over a time ranging from a few days to six weeks. In the most minor circumstances, as with a small sprain, you may want to wear an ankle support for a few weeks to help the healing tendon and prevent you from over-stretching it again. In the case of a major fracture, you could be wearing a splinting brace and using crutches to stay off the ankle for six weeks. For lesser injuries, a steady application of R.I.C.E. (rest, ice/heat, compression, elevation) should be sufficient until your ankle feels better and a doctor confirms that you can return to normal training activities. If you have to immobilize your ankle for a while due to a serious sprain or a fracture, you may need some physical therapy to get back up to functional, flexible and strong movement. If your ankles seem prone to injury, you may want to examine your technique and wear ankle supports more often. Ankle injuries are painful, but often people have the most trouble with giving them time to heal. 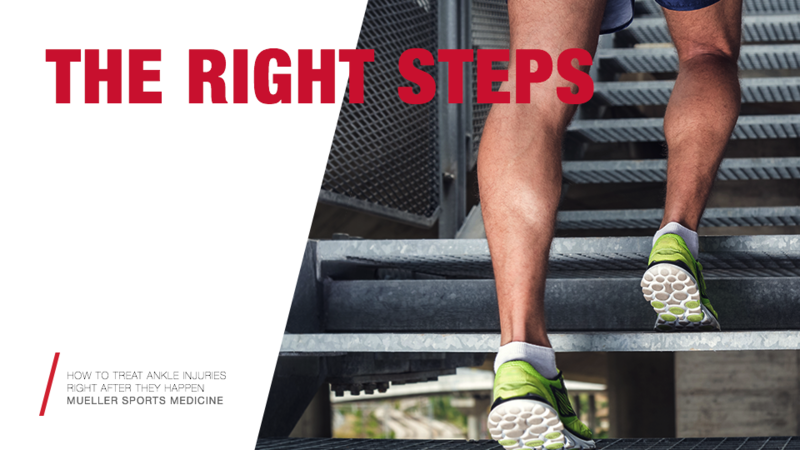 It's natural to want to get up, move around, and get back to your regular exercise routine but the ankle will only take injury more easily a second time unless you give it the full opportunity to heal. The best way to avoid this kind of delay in the future is to work on flexibility and strength when you're done recovering.